For whatever reason, it feels like my progress has been slow in adding to items for the holidays. Now that I think about it I think this is what I always go through when I'm working towards a deadline - I can't seem to get my hands to work fast enough. Oh well...such is life in the handmade business! Your hands can only work as fast as they can. I'm happy with the work I've produced so far! Happy Thanksgiving weekend to all of you. Be safe out there! 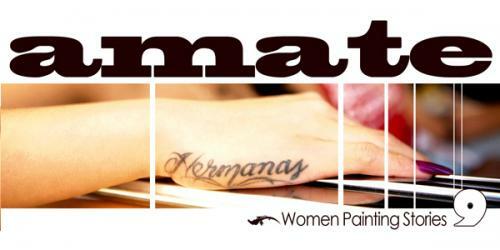 Estudio Martita events to buy handmade for the Holidays! Well its time to put down in writing all the events I'll be doing this holiday season. 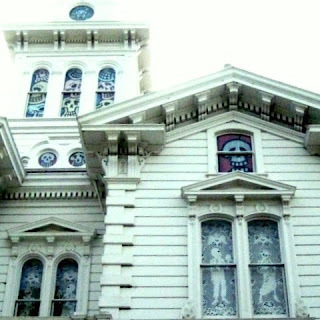 Lots of varied venues throughout the city of San Francisco. I decided to stay local this year - closer to the familia and familia of friends. 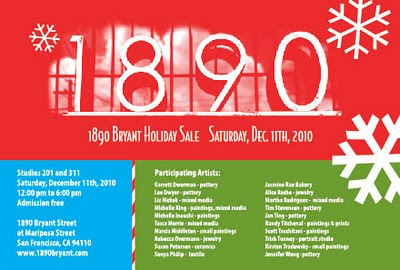 Here's where you can find me for the Holidays 2010! Get a head start on the holiday shopping and find the perfect handmade something for everyone on your list at this one-day-only craft emporium! 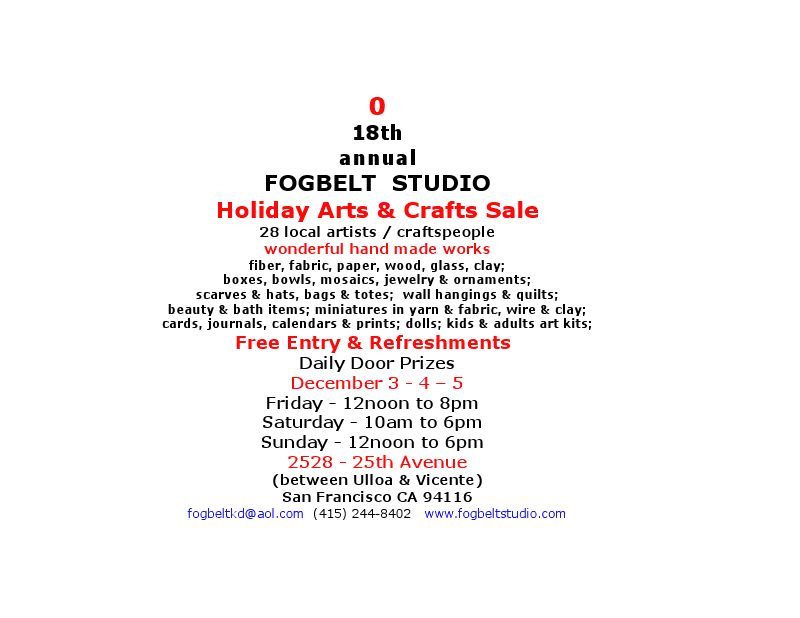 San Francisco locals Black Heart Industries, Denise DeShetler CMT, Estudio Martita, Guerrero Street Handmade, Hansolo Creations, Meredith Nevard, OooMami flicks and The Poetry Store will be on hand selling everything from fine art to jewelry to massage therapy gift certificates. Flush out the tryptophan with a dollar-per-minute massage and Madrone’s happy hour and post-Thanksgiving inspired cocktails! Madrone Craft Bar Pop-up Shop Sunday, November 28, 20101 p.m. to 8 p.m.Free admission and drink specials to flush out the tryptophan! 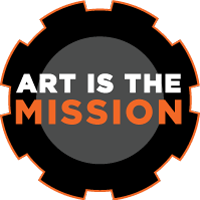 An exploration of the sights and sounds of the Mission begins this December. Join us for a standout spoken word event that has showcased accomplished poets and performers eight years and counting. The tradition continues as Amate spreads its wings and brings the show down Mission Street to Intersection 5M. Founder and organizer Leticia Hernandez presents a ninth year of the finest woman's poetry, performance, song and a group of visual artists selling their work - that's me! Free Entry & Refreshments plus Daily Door Prizes! 1890 Bryant Holiday Sale - in my studio building! So that's if for this year. Hope you can stop by one of the events for a visit, some shopping and some treats. Attended the Dia de los Muertos procession in San Francisco. Those in attendance were every slice of San Francisco within our 49 square miles: latino families, walking with photos of loved ones who had passed on; non-latinos, also walking with photos of loved ones. Hipsters walked the streets, out for a good time or out to participate in the remembrance of loved ones. Burning Man types - The Burners were in attendance with the group Apocalypse cycling their stage coach contraption through the procession. I saw the most beautiful array of Calavera face painting I had ever seen. Artistic masterpieces were being worn by participants in the procession. 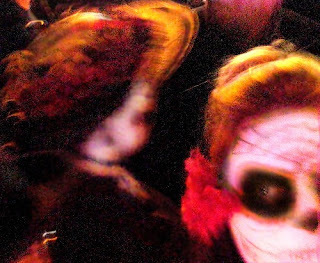 Lots of Catrinas in vintage dress and lots of top hats with no preference for gender in either of the two styles. 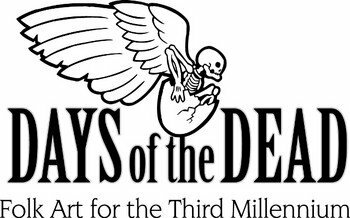 The only group I objected to were the drunken types who treated Dia de los Muertos as any other parade or holiday. 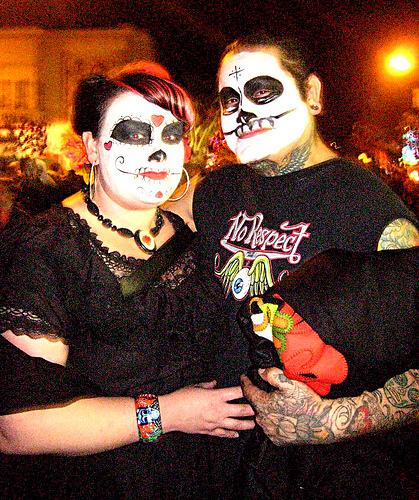 Walking the streets of the Mission with drinks in hand, they acted as if Day of the Dead was Mardi Gras and another excuse to get blasted. WRONG....SO WRONG! 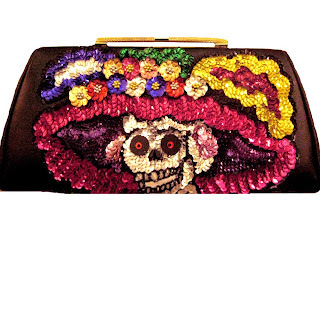 Some might complain that Dia de los Muertos no longer belongs strictly to the Latino community.Well, there might be some truth to this. What I saw at the procession, for the most part, were some individuals taking part in an event that they understood and respected, respected and were curious, reinterpreted to fit in with their lifestyle, were completely clueless but curious or just plain completely clueless. Other than completely clueless, I think there is room for all of this. When an individual decides to participate in an event that is so different from the life they know, I think this is a good thing. It is educating yourself about another culture. Education breeds understanding rather than ignorance. San Francisco is not a perfect city by any means but it is a city that encourages understanding rather than ignorance.That is why I live here in a city that covers 49 square miles. We are all smushed together. Not everyone gets along. Not everyone understands each other. Despite that, there is a large enough cross section of the population where curiosity, understanding of our differences is encouraged. This was the theme I saw that was the most prevalent during the procession - a desire to understand, adopt and encourage. 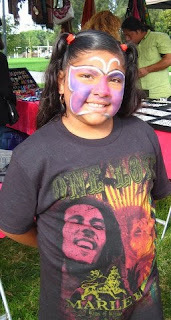 It was a beautiful Dia de los Muertos event. 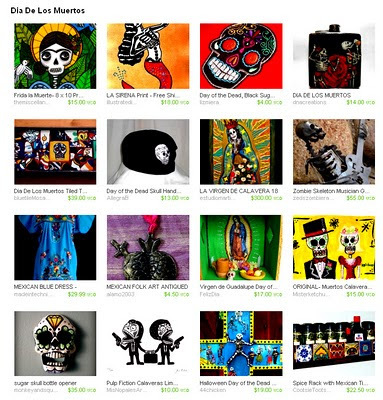 Woke up this morning, went to my computer to check email and found this beautiful tribute to Dia de los Muertos on Etsy. My Virgen de Calavera was also included. I feel honored to be a part of this. 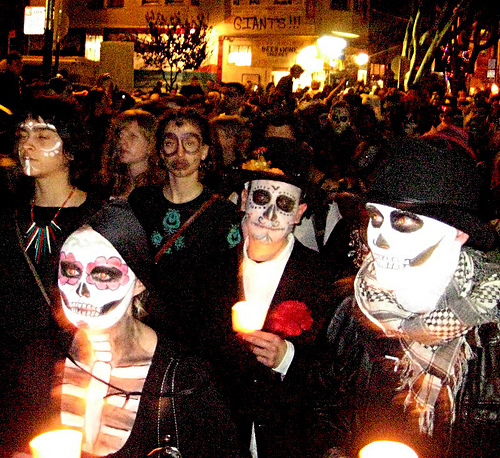 Looking forward to the procession tomorrow in San Francisco's Mission in honor of Dia de los Muertos. Feeling the pull of the spirits during these days. Not a scary feeling like being haunted. Just feel a sense of them close by. Its like being given a group hug by your Dad and grandma even though they are no longer here. Its an otherworldly feeling. No...I am not crazy. 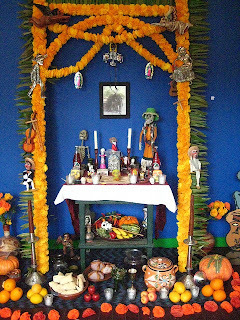 I am just feeling connected to the Dia de los Muertos. 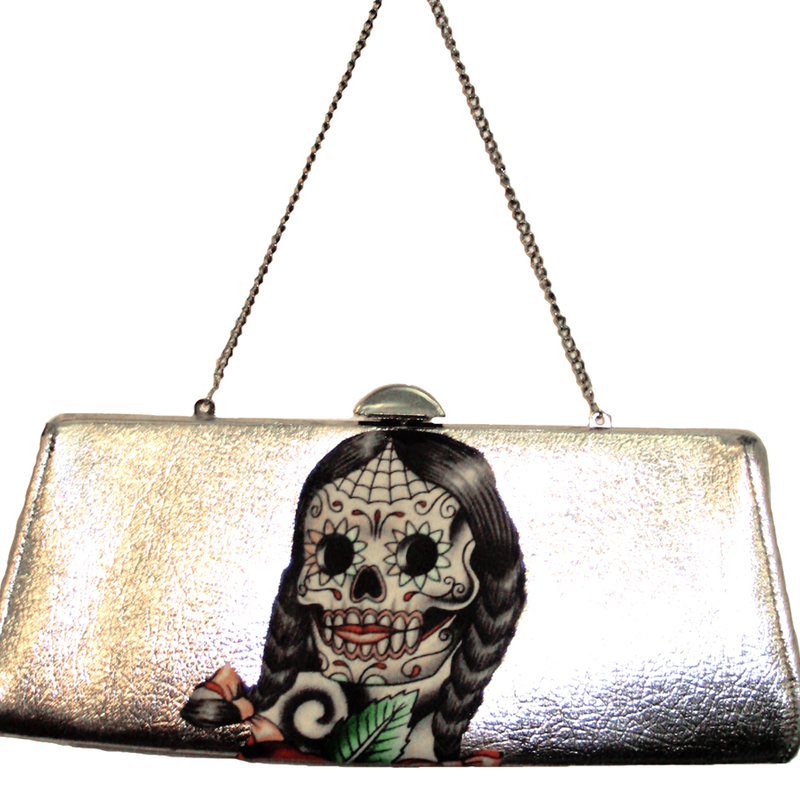 With all my Dia de los Muertos events and open studios happening in October, it was difficult to find the time to post anything new in my Etsy Store. Well the whirlwind has eased up a bit and I finally have some computer time to post new work. 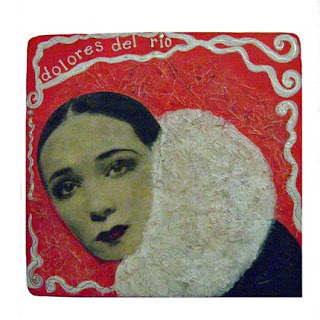 The new work is of two upcycled wooden trays. 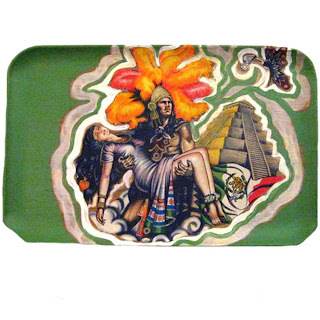 Both have images of the Aztec star crossed lovers Popocatépetl and Iztaccíhuatl. 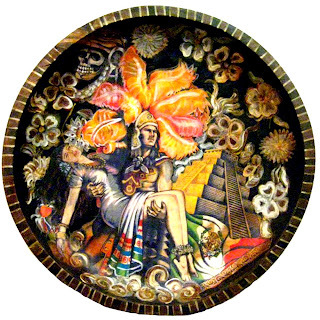 There are many interpretations of this legend but I decided to post the one listed from Mexico Online: http://www.mexonline.com/history-popo.htm. On a clear day, the towering white peaks of the legendary Popocatépetl and Iztaccíhuatl volcanoes can be seen from the great metropolis of Mexico City. Rising beyond 17,000 feet in elevation, these two majestic mountains offer the viewer a breathtaking sight. Snowcapped year round, the well-known landmarks have captured people’s imaginations throughout the ages. Located just 45 miles southeast of the nation’s capital, Popo and Izta, as many affectionately call these two volcanoes, share a story that reaches back into the mists of time. Geographically, these two glacier-iced volcanoes represent the second and third highest mountains in Mexico. The name Iztaccíhuatl in the indigenous Nahuatl language means “White Woman” and the mountain actually includes four peaks, the tallest of which reaches 17,158 feet. Many see her silhouette as resembling that of a sleeping woman, complete with head, chest, knees and feet. Iztaccíhuatl is an extinct volcano and is a popular destination for adventurous mountaineers and hikers. Popocatépetl is the taller of the two mountains, reaching an incredible 17,802 feet in height. Popocatépetl and Iztaccíhuatl are connected by a high mountain pass known as the Paso de Cortés. Popocatépetl is still active with the volcano having spewed smoke and ash as recently as 2001. In the Náhuatl language Popocatépetl means “Smoking Mountain” and as we shall soon see, was aptly named. In Aztec mythology, the volcanoes were once humans who were deeply in love. This legend features two star-crossed lovers, the young brave warrior Popocatépetl and the beautiful princess Iztaccíhuatl. The father of Iztaccíhuatl, a mighty ruler, placed a demanding condition upon Popocatépetl before he could take Iztaccíhuatl as his bride. His mandate required that Popocatépetl first engage in battle against the tribe’s enemy and return victorious. Variations of the legend include the added stipulation that Popocatépetl needed to return with the vanquished enemy’s head as proof of his success. 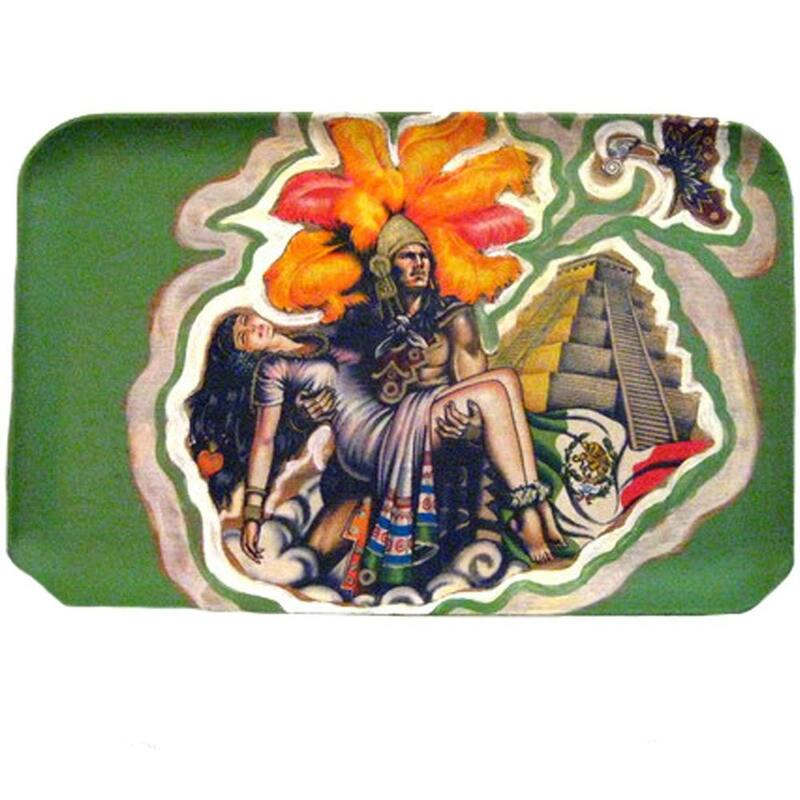 The story continues with Popocatépetl setting off for battle with Iztaccíhuatl waiting for her beloved’s return. Treacherously, a rival of Popocatépetl’s sends a false message back to the ruler that the warrior has been slain when in fact, Popocatépetl has won the battle and is ready to return to his Iztaccíhuatl. However, the princess upon hearing the false news, falls ill and succumbs to her deep sorrow, dying of a broken heart. When Popocatépetl returns triumphant to his people only to encounter his beloved’s death, his heartbreak is inconsolable. 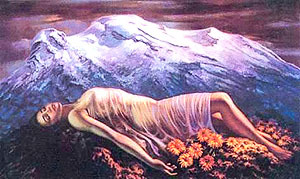 He carries Iztaccíhuatl's body to the mountains whereupon he has a funeral pyre built for both himself and his princess. Grief-stricken beyond measure, Popocatépetl dies next to his beloved. The Gods, touched by the lover’s plight, turn the humans into mountains, so that they may finally be together. 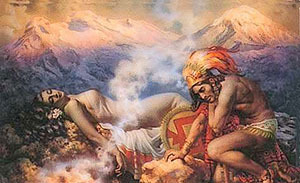 They remain so to this day with Popocatépetl residing over his princess Iztaccíhuatl, while she lay asleep. On occasion, Popo will spew ash, reminding those watching that he is always in attendance, that he will never leave the side of his beloved Izta. All individuals, community members, artists, families are invited to view and participate in the yearly Dia de los Muertos in San Francisco's multicultural Mission. The procession starts at 22nd St. and Bryant and the Festival of Altars, as usual, will be at Garfield Park on November 2. Please bring flowers, photos, mementos, food and/or drink to place on the altars in celebration of the lives of those now gone. existence, mortality and celebration of life. Close to 24th street BART. WHEN: NOVEMBER 2ND, rain or shine! My Calavera A-Go-Go is the cover artwork for a FAB new book by Eileen Clemens Granfors titled "SOME RIVERS END on the Day of the Dead!" Here it is. 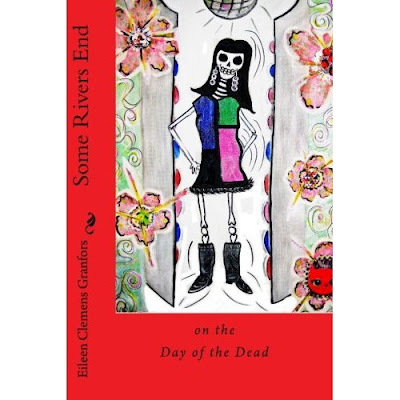 A wonderful first book by Eileen Granfors titled, "Some Rivers End on the Day of the Dead. It is available on Amazon for all of you looking for that special Fall going into holiday gift! 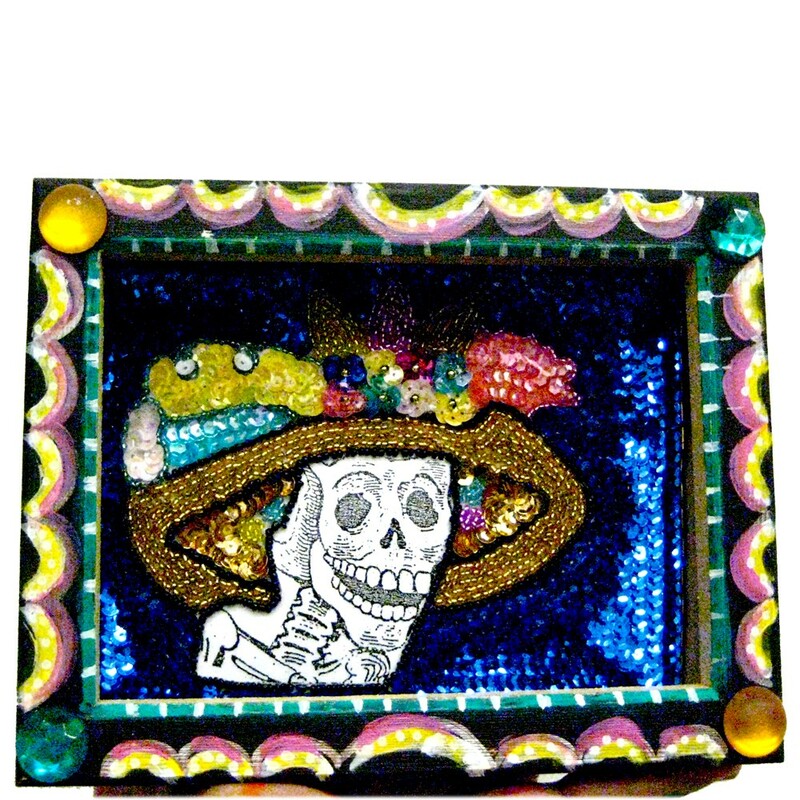 I am so enjoying the experience of seeing one of my calavera paintings on the cover of a Dia de los Muertos themed book. 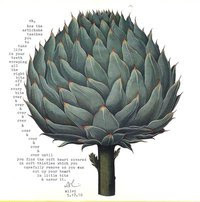 As this is the first book by Eileen, this is also my first experience having one of my paintings published as the cover art for a book. I'm thrilled! I feel very fortunate that Eileen and I were able to connect. I just finished reading Some Rivers End and was completely absorbed in the tale of Marisol's life of transitions and her relationships with new and old friends. Many of us can remember the trials and tribulations of being a teen. To experience those times divided between two countries is even more painful. Some Rivers End was a great read. I highly recommend it! 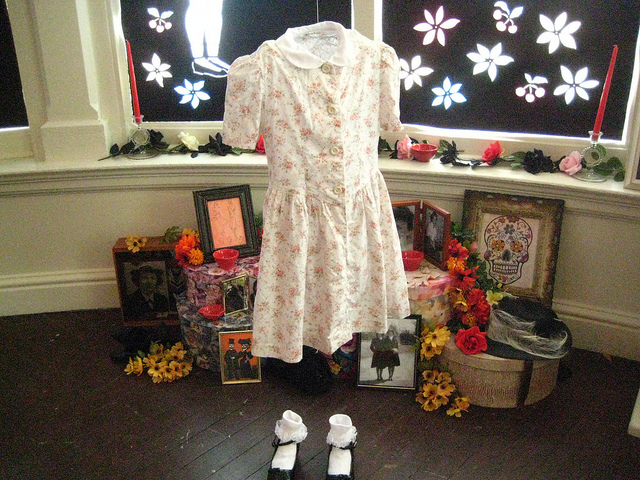 OAKLAND MUSEUM COMMUNITY CELEBRATION FOR DAYS OF THE DEAD COME JOIN US! Join us as the whole Museum comes alive with the spirit and tradition of Days of the Dead. Explore the exhibition VIVO: Days of the Dead 2010 in the Art Galleries and enjoy dance by Besh Beni and Chan Kahal, music by SonRisas and Ixim Tinamit, and ceremonia with Ernesto Olmos. 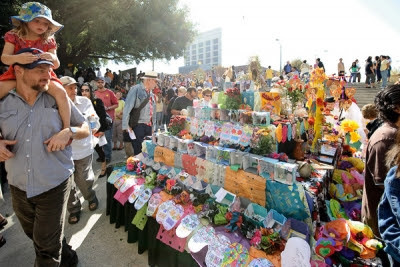 Watch demonstrations of traditional Meso-American arts and foods, and buy local Days of the Dead merchandise for your home altar from our mercado. 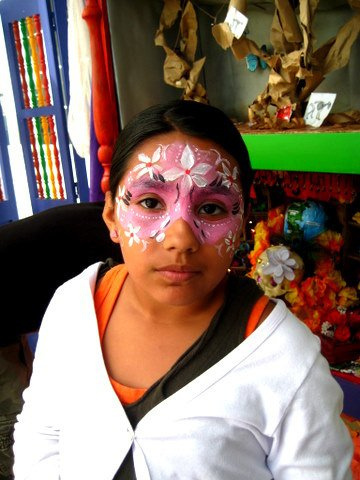 Make your own masks, dancing calaveras, and tin ornaments. Local food vendors will sell tasty tacos, tamales, and vegetarian Mexican food. General Museum admission includes the Community Celebration, the VIVO: Days of the Dead exhibition, and OMCA's Art and History Galleries. Hipsta Vera series featured on ArtBistro!! 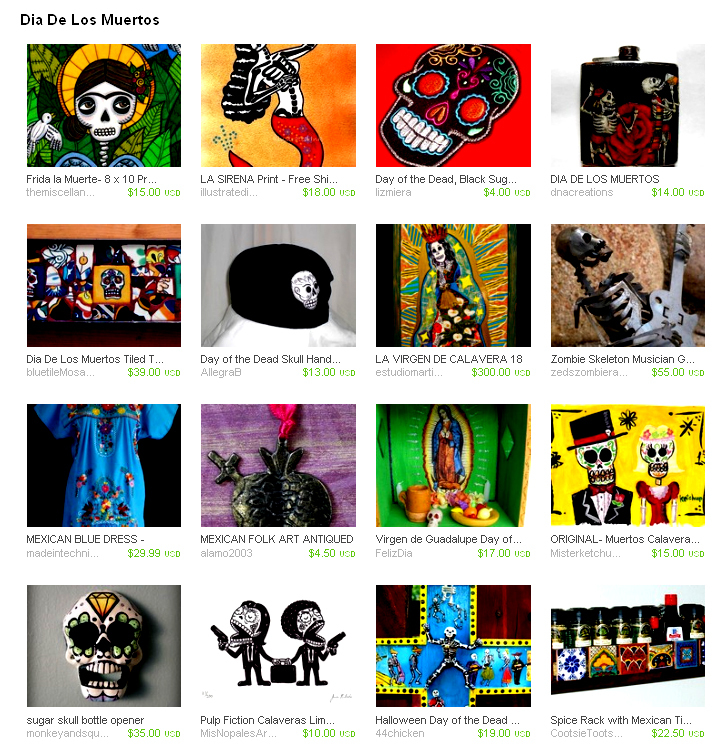 I am so, so happy that my new Dia de los Muertos artwork for 2010 has been featured on the website ArtBistro. Welcome to the Underworld — and don't forget your wayfarers, because it's stylish here. 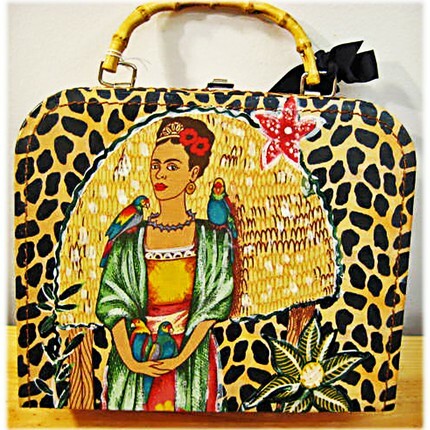 Meet Martha Rodriguez: a self-taught, Chicana urban folk artist (and no, that's not her on the left, that's her work). We've chosen her album Hipsta-Veras as our Day of the Dead feature. 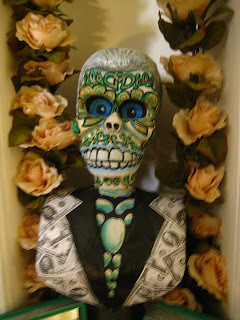 The Day of the Dead, or in Spanish, Dia de los Muertos, falls on November 2 of each year. 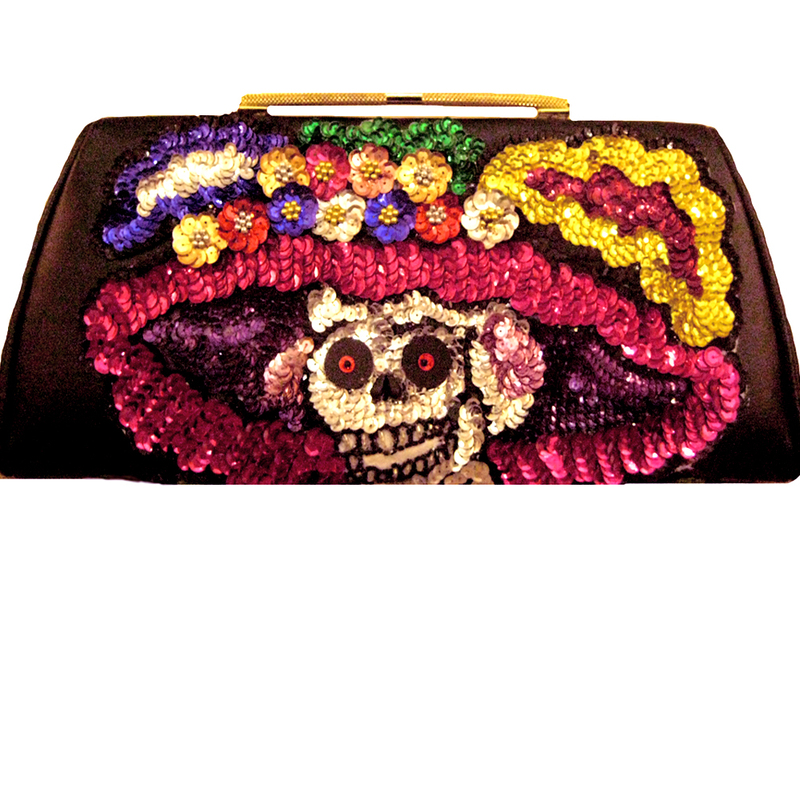 Rather than being a scary or frightening holiday (it's frequently lumped together with Halloween), Dia de los Muertos is a joyous time for remembering lost loved ones, reflected by vibrant colors, sugary skull treats and overall, the unique Chicano cultural view of death and loss. Ms. Rodriguez's work takes that lightheartedness a step further into hipster territory, swirling two distinct cultures together to make a delightful collection. So take a look at the article and let me know what you think. I'd love to hear from you! A few of the fabulous sites, adorable participants of the Dia de los Muertos family celebration at the Meek Mansion in Hayward CA. I'll be one of the crafty vendors participating in this event. Come on by! Days of the Dead Community Day! Presented in partnership with Hayward Area Recreation and Park District. You can participate! Bring canned food for the community altar. All the food will be donated to a local food bank. We may initially look like we don't get along but we are great studio mates and great friends. 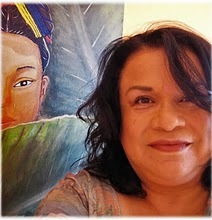 She is a latina urban folk artist established in San Francisco, California. Her art for me is so full all of this things I left in my Mexico Lindo. When I look at her work all the images of my homeland thrive in my mind. You want to know more about her, here is a great interview. 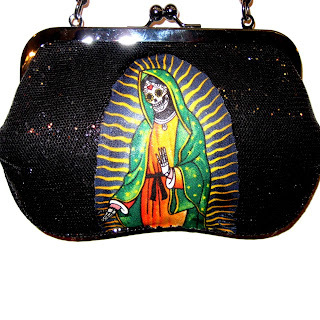 Being a Latina / Chicana born and raised in California, I’ve always been drawn to images, icons of all things Mexican. I’m a 3rd generation Chicana. When your family has lived that long in the U.S. your country of ancestry, in my case Mexico, becomes only a distant memory. It is up to you to reconnect with the customs, imagery and language of your ancestors. Well I’ve done a great job with the customs and imagery. Here is where my artwork reflects my Mexican ancestry. My Spanish language skills though are pitiful! Two out of three aren’t so bad! I also became more focused on crafting when I lost a friend 13 years ago to a violent crime. She was a wonderful influence in my life – full of positive energy – despite many troubles in her youth. When I lost her, I realized life was too short to waste on indecisiveness. I had always felt the creative spark. I decided then to take it on full time and create. As far as the types of crafts I create, I’m all over the place. I like to work with upcycled items, renewing them and recreating them. I make some jewelry usually with images of Frida Kahlo. I also do mixed media work on canvas. I love to use image gel transfers, painting black and white images and creating a new background. I also love painting on canvas with acrylics. I just finished a Dia de los Muertos collection called HIPSTA-VERAS. 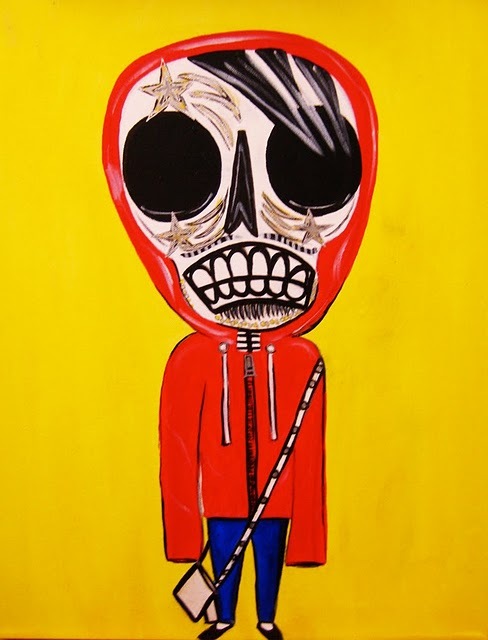 Its based on Hipsters you see in urban populations but they all have huge skeleton heads, little bodies dressed in the style of hipsters. It’s really a fun collection. 2. How long have you been crafting? I’d say I’ve been crafting about 15 years. 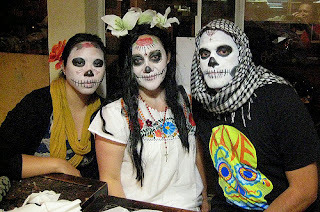 When my kids were first starting school, I wanted them to experience the holiday of Dia de los Muertos. I worked with their teachers and created a Day of the Dead lesson plan. I’d show up with books on the holiday and created lots of sugar skulls during that time. 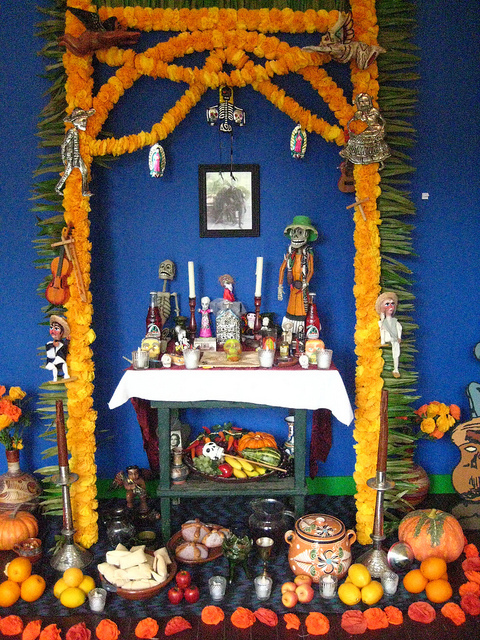 We also created an altar in their classroom. It was a very creative time for me, my kids and their friends. 3. How did you get started selling? In a previous career, I had been a jewelry sales rep. I had done trade shows and sold out on the road. You would think it would be easy to sell my own stuff. The truth is it was a lot harder. When you are presenting your own work, it is so much closer to you. It’s hard not to take things personally. I had to force myself to get myself out there and use the resources I had. 4. 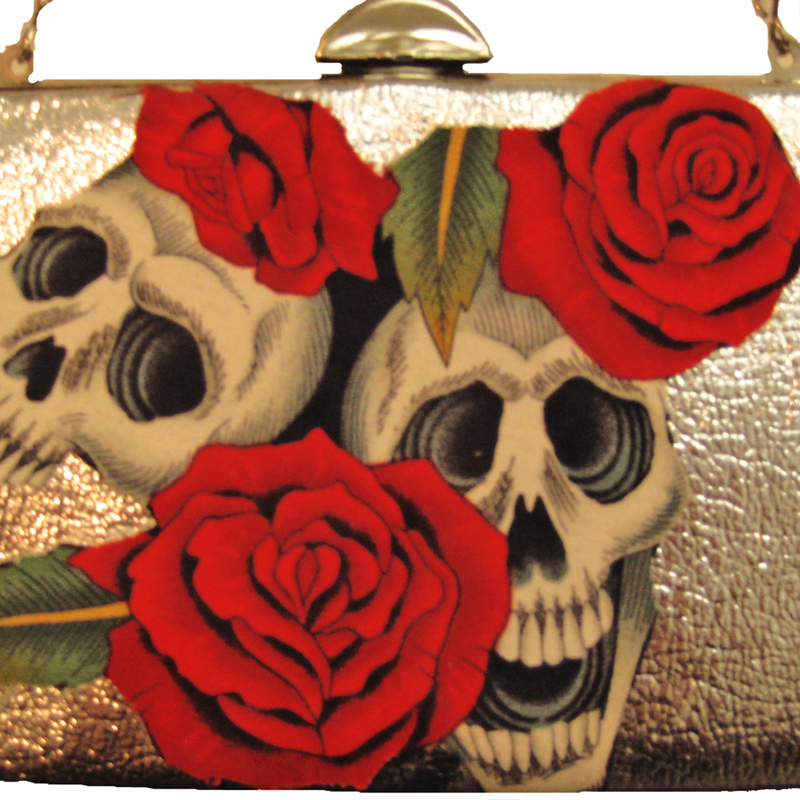 What does selling on Etsy mean for you? Etsy has been a great way to sell my work online. It’s a great starting point. When you are trying to introduce your work to more people in the U.S. and beyond, what easier way is there than go with Etsy? Unfortunately, Etsy is now overwhelmed with creative people trying to sell their work. It has become much harder to get seen. This is where promotion has become absolutely necessary. You can’t just wait for buyers to find you anymore. 5. Which colors do you use most in your work? 6. How do you promote your work? Even if I don’t have new work posted on Etsy, I always post daily to Facebook and Twitter something from my Etsy page. It may seem like overkill but I think it’s the only way to remind customers online that you exist and have work available to sell. 7. Can you share your #1 tip for success? a. Promote every day on Facebook and Twitter. b. Try to create an item that is easy to make, easy to sell and not too expensive. That way you can add something new regularly (once a week?) without it taking too much time and energy. c. Don’t listen to those feelings of doubt. Enjoy what you do. That’s the most important thing. d. Learn from mistakes, Don’t let them hold you back. e. Always look to the future that your business will grow, your work will get better and better! I guess those were 5 tips. It’s hard to pick just one! 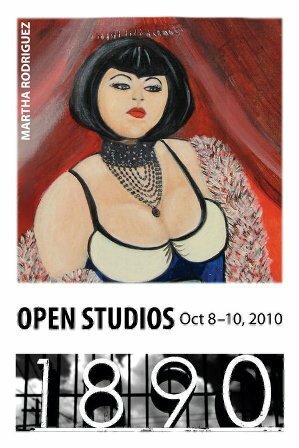 Thanks to Martha for sharing with me her time, her art work and a little part of her life.